First of all, teaching and learning are difficult tasks, no matter what the subject is, and not for the fainthearted. Ask any student or educator, and they will tell you. Or simply think about your own educational experiences. 1. Delivering core content knowledge, including knowledge about everything from transportation networks, climate systems, watersheds, energy, natural hazards, population change, and much more. 2. Developing skills, including geotechnology-related skills to perform spatial queries, grapple with map overlay operations, and generate spatial statistics, as well as other technical skills such as work with databases, imagery, data formats, multimedia, and much more. What is a geodatabase and how does it compare to a database? How can locations be mapped? How can I work with latitude and longitude pairs, or street addresses? What are the pros and cons of choosing a certain map projection over another? The same long list of foundations could be said about hundreds of other skills in a GIS environment. These foundations must be understood to make effective use of the skill and tool, but even more importantly, to understand how the skill should be used, and what the results actually mean. 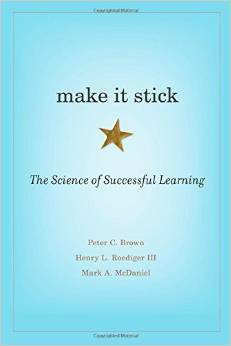 The core tenets in the book “Make It Stick” provide key insights for teaching and learning with GIS. 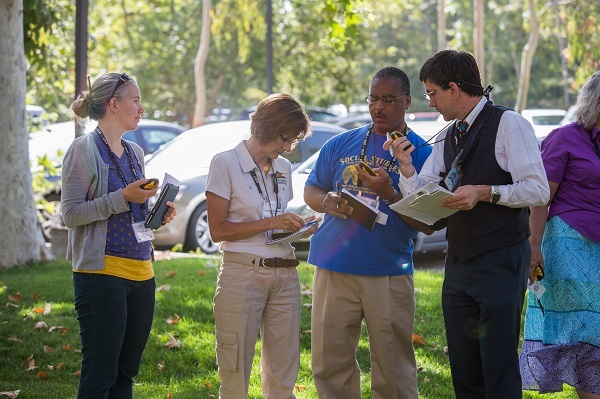 Above, collecting field data at a GIS institute for educators, “Teachers Teaching Teachers GIS” (T3G), on the Esri campus, Redlands, California. Recall a time when working with GIS when you tenaciously stuck to a problem you were grappling with and finally figured it out, no matter how long it took. That shouldn’t take long: Because it was effortful, you are not likely to forget those times, nor the skills that you gained by doing so, either. If learning was easy, according to these authors, and no doubt confirmed by your own experiences in using GIS, we certainly wouldn’t remember it as clearly. And by implication, we wouldn’t be building a foundation for new knowledge, as I will expand below. The authors also claim that “all new learning requires a foundation of prior knowledge.” How often do we as educators, or we as students, want to skip right to an advanced task without understanding the knowledge and skills that need to be in place first? For example, I was recently teaching a workshop on mapping field data, and my workshop included seven ways to map the data. Many of the workshop participants wanted to skip to the last item on the agenda–citizen science mapping with live web mapping services–before understanding how data can be mapped and what a mapping service is in the first place. I certainly couldn’t blame them, recalling times when I as a student wanted to do the same thing—I wanted to understand how to perform “Method 7” when I did not understand “Method 1”. Finally, the authors claim that “putting new knowledge into a larger context helps learning.” We need to ensure, for example, that a GIS-based activity on climate, for example, draws on the larger context of such topics as climate systems, climate change, the difference between climate and weather, scale, and so on. One of the purposes of the Esri educational initiatives and means of communication such as GeoNet, Esri blogs, magazines, and newsletters, the T3G institute, ConnectEd, and others is to ground the use of GIS in the larger context of educational best practice. We also aim to ground the knowledge within the content domains of specific disciplines, such as geography, history, mathematics, environmental studies, and others, and we also aim to ground the knowledge within the context of other geospatial skills, trends in the geospatial industry, educational learning theory, educational content standards, and even in societal trends. Even the tried-and-true activity of using GIS to teach about plate tectonics should take place in a larger context of the physical processes of the Earth and the relationship between earthquakes, volcanoes, and plate boundaries. Otherwise, when students complete the activity, they may have learned some GIS skills but not how and why earthquakes occur where they do, and why it all matters. There are other instructive gems for teaching and learning with GIS, such as “learning is an acquired skill, and the most effective strategies are often counterintuitive”, but I’ve run out of space in this article. I leave it to you to read this book and to share your comments in GeoNet.